The two church towers, near the center of the photo, identify St. Mark's Church N. Division and Pearl St., which is visible all the way to Canal St. (now Monroe). 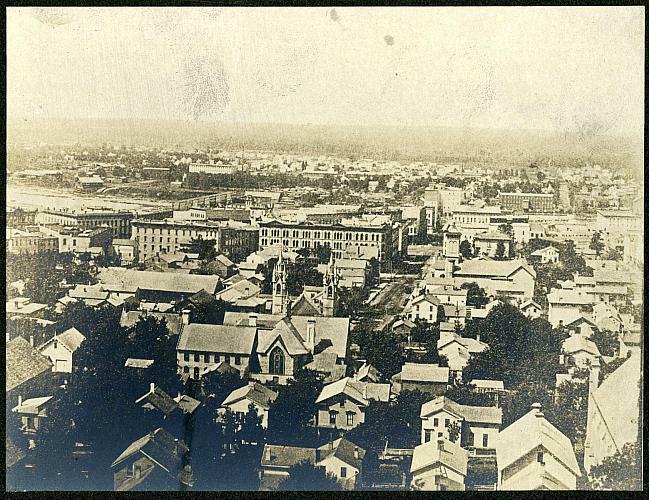 Three relatively large buildings in the center of the photo, from Pearl St. to the far left, are the Ledyard Building at the SW corner of Pearl and Ottawa, the "Flatiron Building" at the NW corner of Ottawa and Monroe, and the Luce Block at the SW corner of Ottawa and Monroe, currently the location the the Grand Rapids Art Museum. The Ledyard and "Flatiron" buildings are still part of the downtown landscape. Crossing the river beyond the Luce Block is the Grand Rapids & Indiana Railroad bridge, now the Blue Bridge. Title by cataloger. From a collection of photographs depicting Grand Rapids around 1872, previously owned by Charles E. Belknap, author of "The Yesterdays of Grand Rapids" and longtime resident of the city.